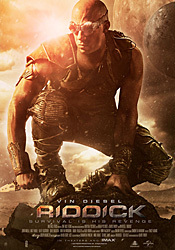 With Riddick hitting Blu-ray and DVD on January 14 (it’s already available on Digital HD), Universal Studios Home Entertainment has released the first 10 minutes from the film, which earned almost $100 million worldwide. Check it out below! The latest chapter of the groundbreaking saga that began with 2000’s hit sci-fi film Pitch Black and 2004’s The Chronicles of Riddick reunites writer/director David Twohy and star Vin Diesel. Diesel reprises his role as the antihero Riddick, a dangerous, escaped convict wanted by every bounty hunter in the known galaxy.